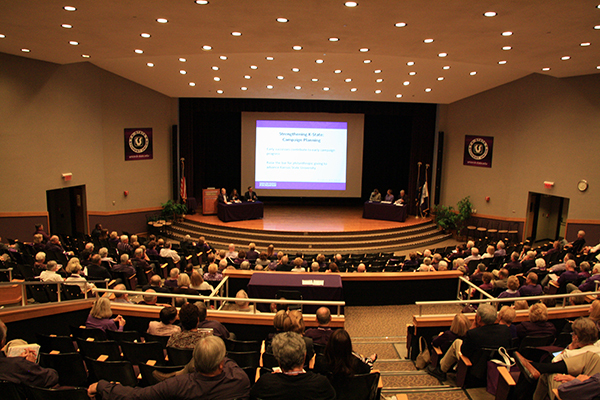 Information, inspiration and purple pride were everywhere at the 2013 annual meeting of the K-State Board of Trustees in September. More than 321 trustees traveled from 17 states to make the meeting a great success. The Board of Trustees welcomed 21 new members with an orientation session on Thursday. 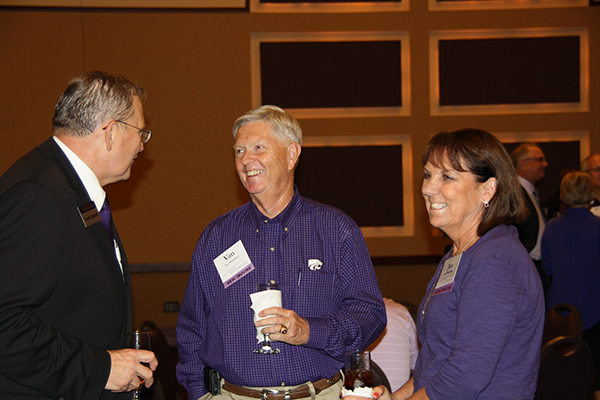 Pictured here, KSU Foundation President and CEO Fred Cholick visits with new members Van and Janice Witthuhn, Hays, Kan.
Fall brings lots of excitement to K-State, including the kickoff of the All-University Campaign for K-State. The annual campaign allows faculty and staff on all three campuses to support the areas of the university they care about most. Since 2007, the number of faculty and staff who make gifts to K-State annually has increased by 146 percent. In 2012 alone, 42 percent of faculty and staff — or 2,100 employees — made gifts to the university totaling more than $1.3 million. The decision to make a planned gift is a highly personal one. But recently, some loyal K-Staters agreed to share their thoughts about why they made planned gifts to K-State in this video. In their own words, these K-Staters share their motivations for giving, and students on the receiving end of planned gifts share how their lives have been changed by the foresight of others. If you are interested in finding out more about planned gifts, contact Kent Sedlacek, senior director of gift planning at the KSU Foundation, at kents@found.ksu.edu or 785-532-7521. Thank you for being PROUD! 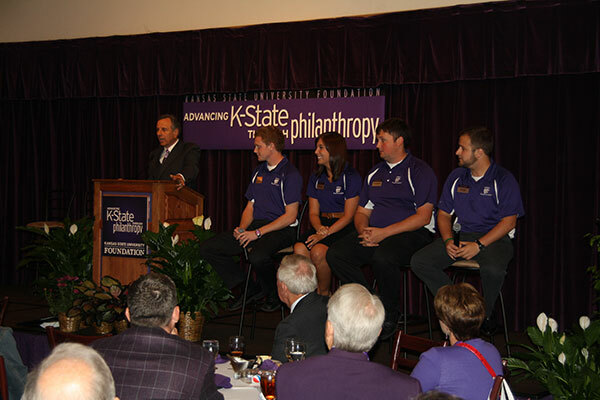 K-State Proud, a student-led, nationally recognized fundraising campaign, succeeded in raising more than $105,600 this year. In the first seven years of the campaign, more than $650,000 has been raised and some 300 students have received awards, helping them stay at K-State and complete their education. Read more about K-State Proud and its impact here. 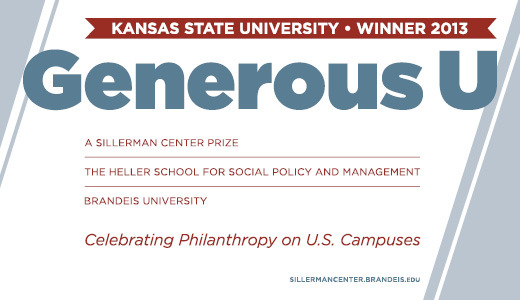 Contributions to K-State Proud establish Student Opportunity Awards for students who are struggling financially and have exhausted all other forms of financial assistance. Imagine being a student at Kansas State University, working hard to earn a degree, when something unexpected happens that makes it financially impossible for you to continue your studies. Imagine that gut-wrenching, sick feeling in the pit of your stomach as you see your dreams slipping away. Now imagine that your fellow students all chip in and give you the money you need to get through the semester or year. Sound unbelievable? It’s not. That very scenario has played out many times each semester for the past seven years at K-State thanks to K-State Proud. 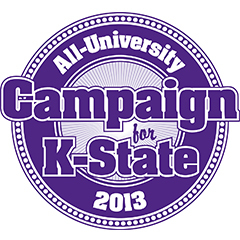 Guided by the Student Foundation, the K-State Proud campaign is all about students helping students. Meet some of the Student Opportunity Award recipients. Reports from the standing committees of the foundation were given by their respective chairs at the Board of Directors’ meeting on March 1. Click on the committee name to see the full report. Reports from the standing committees of the foundation were given by their respective chairs at the Board of Director’s meeting on Dec. 14, 2012. Click on the committee name to see the full report. A highlight of the Board of Trustees meeting each year is student participation. Above, a student panel shares their experiences with scholarships, study abroad, leadership and honors programs.